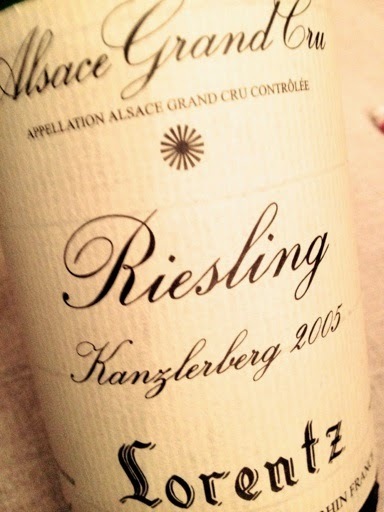 Kanzlerberg is the smallest Grand Cru in Alsace, just over 3 acres with only two owners, Lorentz and Sylvie Spielmann. It is located next door to the sun-drenched Grand Cru Altenberg de Bergheim giving golden yellow, generous but elegant wines with subtle oranges and honey aromas. But Kanzlerberg is not so exposed, and the clay soil makes the wines much more tight, requiring long cellaring to show their best. 2005 Riesling Grand Cru Kanzlerberg from Lorentz in Bergheim has a dense, greenish-yellow color. The aroma is complex but restrained and provides grapefruit, limes, fresh herbs and quince. The palate is medium-bodied and quite dry, and the powerful fruit gradually develops in the mouth. The wine has excellent structure, and the lovely acids make the saliva flow. A wonderful wine for wine enthusiasts. Price (2009): € 21.